The Charoen Pokphand Group (C.P.) is Thailand's largest agriculture-based conglomerate with hundreds of subsidiaries. The CP Group currently employs over 280,000 people with offices and factories located worldwide. One of the subsidiaries, Charoen Pokphand Foods, was established in 1978 and now is the largest producer of poultry in the world. ANKO is a food processing equipment manufacturer from Taiwan providing functional and quality food processing machines to ensure C.P. Group delivers foods exactly the way they want, and in the end makes their food business profitable. Their cooperation started with PT.Centralwindusejati's research for shrimp wrap skin processing machine. PT.Centralwindusejati is one of C.P.' subsidiaries and they were exporting shrimps to Japan, the U.S. and Europe, where shrimps are popular. The shrimp business was prosperous for years; however, the recent economic downturn had reduced their profit. Later, PT.Centralwindusejati began to sell shrimp spring rolls to expand their market. The business was good, there were lots of shrimp wrap skins required, and PT.Centralwindusejati was purchasing them from a Singapore company. Nevertheless, the skin got too expensive and always resulted in long wait times. As a result, PT.Centralwindusejati decided to make their own wrap skins and eliminate dependency. "When a Japanese company buys shrimp spring rolls, they request five, non-breaking full shrimps perfectly wrapped. The high standard of shrimp spring roll can only get done by hand, so when we visited PT.Centralwindusejati's factory, there were hundreds of staff placing stuff into shrimp roll wrap skins which was quite amazing. Because of it, PT.Centralwindusejati asked to buy shrimp roll wrapper processing equipment only", Mr. Wang, the manager of ANKO recalled. PT.Centralwindusejati met ANKO and other food processing equipment manufacturers at the tradeshow, and after conducting assessments, they chose ANKO as their machine supplier. Since it was PT.Centralwindusejati's first procurement of shrimp wrap skin making machine, besides machine design, ANKO also provided ingredients to make the exact skins. ANKO's machine helped reduce production costs, and the quality of each skin is controlled. Automatic Spring Roll And Samosa Pastry Sheet Machine (SRP-Series) is a food processing equipment for all kinds of pastry sheets. 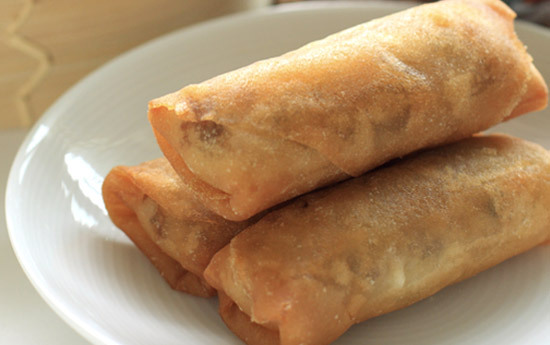 The SRP series machines are designed to produce a continuous spring roll pastry and samosa sheets. After the pastry sheets are cut, they are counted and stacked in piles along a conveyor belt, ready for packaging. Because of their great satisfaction, PT.Centralwindusejati introduced ANKO to one of C.P.' subsidiaries in Thailand named C.P. RAM that has been buying food processing equipment from other countries. After trying out ANKO's spring roll skin making equipment, C.P. 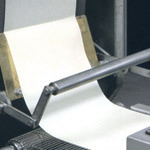 RAM continually ordered 7 more in addition to a mini bun making equipment ( HLT-700XL + EA100R ). C.P. RAM pointed out that ANKO's food processing machine is not only designed to meet each buyer's specific requirements, they also act as a consultant providing innovative design to ensure your food business is profitable. Later, ANKO became C.P. Group's reliable supplier delivering cutting edge food machines, including dumplings, buns and samosas processing machines with competitive price. Meet ANKO's multipurpose filling & forming machine, and automatic mini juicy bun & manty machine with lifting system (EA-100R) for you to produce foods with stuffing! In the U.S., Europe and Japan, ANKO has been selling spring roll processing machines widely due to the trend of Chinese cuisine. ANKO's 100% automatic, one person operated spring roll making machine is particularly popular because of the high labor cost and hygiene requirements. 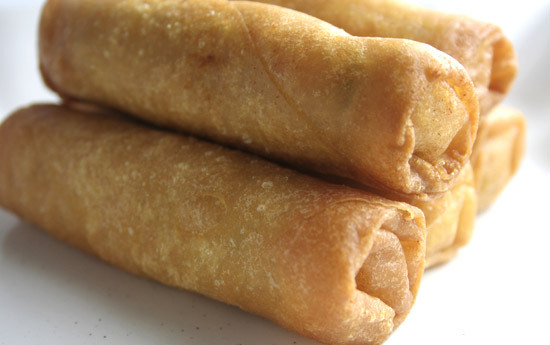 If a buyer wishes to make various sizes of spring rolls, ANKO also offers semi-automatic spring roll processing machines. 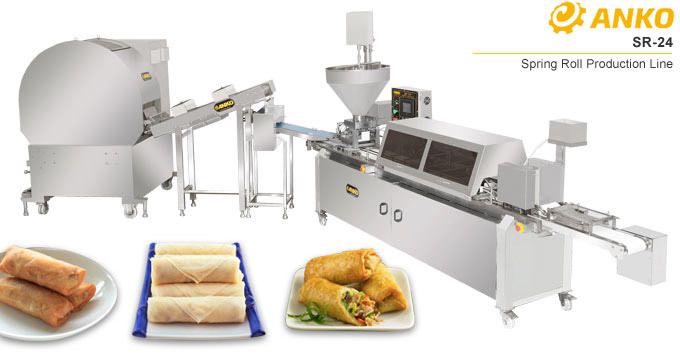 The SRPF series machines are perfect for making foods that require thin wrappers such as spring rolls, samosa... etc. 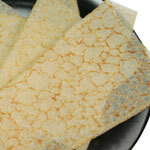 Various stuffings can be used such as beff, pork, seafood and vegetable. The SRPF series machines are designed for using in production line. The SRPF series machines are designed to produce a continuous sheet of baked pastry skin to be cut. 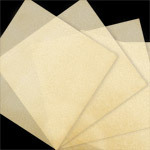 Both length and width of the pastry sheet can be adjusted to desired specifications. 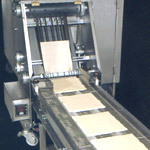 A stuffing depositor then places stuffing and glue paste onto the pastry sheet as it travels along a conveyor belt system. Workers on both sides of the conveyor belt can then wrap and roll them into spring rolls. 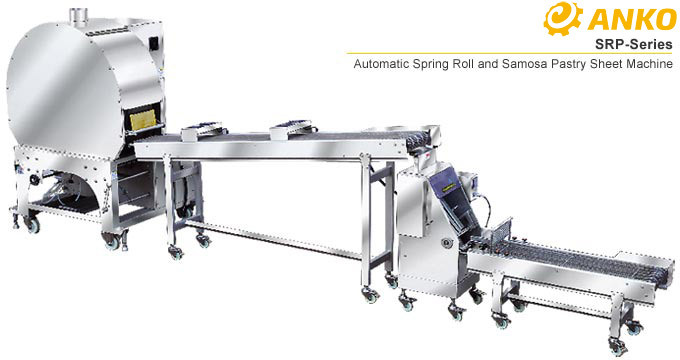 Semi-automatic spring roll and samosa production line (SRPF). 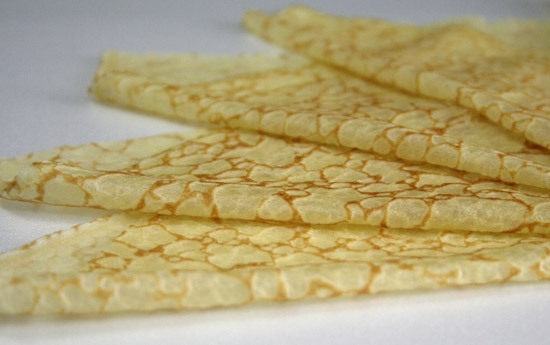 SRPF-series are designed to make food products including spring rolls, samosa and other types of foods that require thin wrappers. 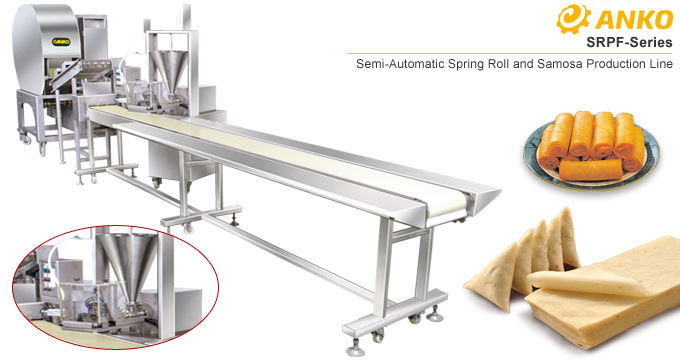 SR-24 is equipped with special folding & rolling device, to produce spring roll like handmade. SR-24 provides high production capacity and adapts to your needs. Customize machine, size is adjustable. According to customer's requirement, this machine can attach different optional devices to produce various kind of products. Advance design, sanitary and safety device. Reasonable price. According to the bog and medium production demand, we supply suitable machine to assist our clients to produce more value added products. Easy to operate, ressemble, clean. The machine is easy to assemble, clean and maintain. Uniform products and high capacity. For LIVE HELP, just click "Live Help Desk", our specialists will be with you online shortly.